I missed the V/H/S, but I have been intending on catching up on it as I heard some really interesting (if varied) things about it. 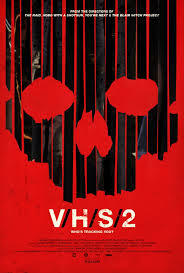 I better get cracking, because the sequel V/H/S/2 is coming our way soon. They seem to have some pretty impressive directors responsible for the short films that make up this anthology. Even though I am not generally a fan of found footage films (I mean who is really) I am pretty intrigued to see this I have to say. What about you guys? And what did you all think of the first one? I am totally pumped for this even though the first one was – eh – so/so… this looks good! Yeah I am going to try and see the first soon, even though the general consensus seems to be meh. 2nd most anticipated film of the year. And the first sir? I’m going to guess (with no basis) Man of Steel?